A cat's need to scratch is instinctive. It helps them to sharpen and remove the dead outer layer of their claws; stretch and flex their bodies; and to work off energy. The Catit® "S" Cardboard Scratcher provides your cat with the rough scratching surface it needs, while helping to protect your furniture and carpets from claw damage; all in an attractive and contemporary design. Remove plastic wrap. Place "S" Cardboard Scratcher in an area your cat is familiar with. If necessary, rub some of the included catnip onto the "S" Cardboard Scratcher in front of your cat to entice it to approach the board. Remember, your cat may need some time to get used to the "S" Cardboard Scratcher. Add catnip as necessary to recharge the "S" Cardboard Scratcher. Replace the "S" Cardboard Scratcher when it becomes excessively worn. 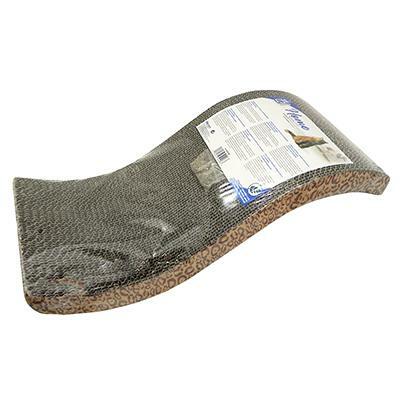 Scratcher measures approximately 21" x 9" x 5"